Dental Implants Seattle: When Are Same-Day Implants A Possibility? If you’ve researched dental implants before, you may have heard the term “same-day dental implants.” If you’re accustomed to traditional dental implants, this may come as a surprise to you, considering the fact that just several years ago it was unheard of to have implant surgery and walk out of the office the same day with functioning teeth. Oftentimes, patients would have to visit their periodontist consecutively over several months before the procedure could be performed. So, what has changed in the industry to make this possible? And in what situations are same-day implants feasible? Let’s take a look. The first successful dental implant was placed in 1965 by a Swedish orthopedic surgeon named Per-Ingvar Branemark. This achievement marked a significant milestone in the practice of osseointegration (connecting living bone tissue and an artificial implant). Although periodontists had the know-how to perform dental implant surgery, they lacked the technology and tools to predict the success rate or to perform the procedure in a timely manner. Oftentimes, implants would be rejected by the body and the periodontist would need to extract them. Fast forward to today and dental implants have a success rate of 98 percent and same-day implant procedures are becoming more common. There are several major advancements that have made this possible. Although traditional x-ray scans are helpful in determining the position of teeth within the mouth, they are ineffective in mapping out the teeth from a 3D perspective. However, there’s a difference between a cone beam CT scan and a conventional CT scan. In a cone beam CT scan, a cone-shaped x-ray rotates around the patient’s head to produce several images called views. Since the images are high quality, it’s effective in diagnosing the structure of the jaw, teeth, and sinuses. However, it’s ineffective when it comes to soft tissue like muscles and nerves. Another major tool your periodontist will use before your implant procedure is an advanced dental implant planning software. This software will allow your periodontist to see full 3D images of your teeth and jaw so the precise location and angle of dental implants can be determined. If you have issues with occlusion, 3D planning software will enable your periodontist to set your new teeth in a way that reinforces a healthy bite. If your periodontist finds significant bone loss in the jaw before the procedure, they will be able to perform a bone grafting in order to restore some of the lost tissue. Not only does this improve the success chance of your dental implants, but it will ensure they remain sturdy and reliable for years to come. Even patients who have lost bone tissue in the jaw may still be eligible for same-day implants. 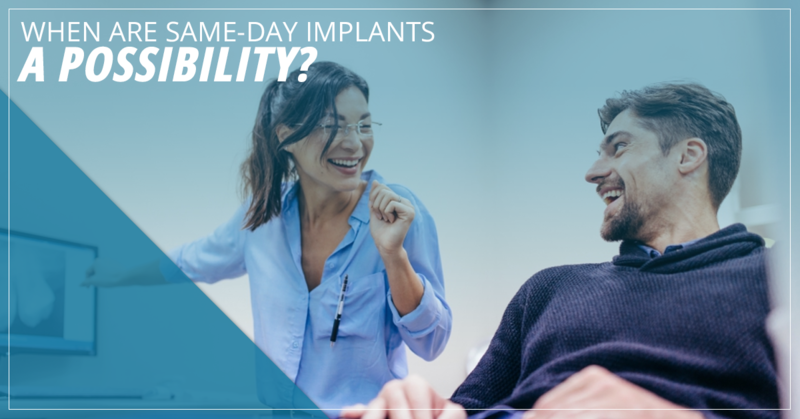 Believe it or not, most patients are eligible for same-day implants. Due to state-of-the-art technology, periodontists are able to use non-intrusive methods for both extracting and placing implants. This allows for a much quicker recovery and osseointegration process and prevents any significant bruising or inflammation in the extraction site. Oftentimes, even All-On-4 procedures can be done in a single day, which replaces a full row of teeth supported by four precisely placed implants. With that being said, if your periodontist sees any reason why the dental implants may fail with a same-day procedure, they may advise waiting for bone tissue to regenerate or perform additional procedures to help the process along. If you’re interested in learning more about same-day dental implants, you should schedule an appointment with us today. Led by two of Seattle’s top board-certified periodontists, Dr. Rapoport and Dr. Schuler, we offer comprehensive dental implant consultations in our state-of-the-art facility. Although our aim is to provide as many patients as possible with same-day dental implants, we’ll be honest about your oral health in order to ensure your long-term success. Call us today to get started.